Customers have a habit of demanding lower prices, especially when they believe a product’s price represents a huge profit for the company. The case in point here is e-books, just one of many digital products facing the e-pricing dilemma. In recent weeks, thanks to the soon-to-be-released Apple iPad, five of the six major publishers banded together to demand a change in price. Up until now, Amazon, the leading e-book seller, has set most bestsellers at a $9.99 price point, but by making a deal with Apple to price books from $12.99 to $14.99 and threatening to remove their products from Amazon’s online store and it’s e-reader Kindle, the publishers were able to push up the price. A hardcover books costs about $26. After all the production, editing, marketing, and author’s royalties are paid (see graph), the publisher actually only sees about $4.05 in return, but that’s before any of the overhead bills are paid. Compare this to $12.99 digital price. 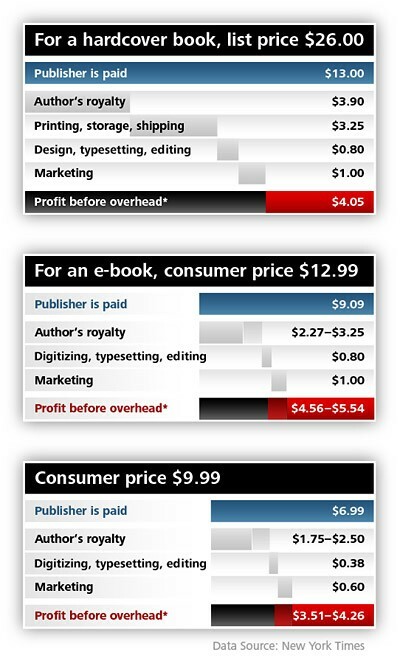 In the new set-up with Apple, the publishers make between $4.56 to $5.54 in profit (see graph). But this profit does not actually represent how much profit a publisher makes off any book. Like movie producers, publishers expect a loss on most of their products. Most books are published and disappear from the bookstore shelves long before the publisher recoups the author’s original advance and the original run’s printing costs. In the end, publishers truly only make money off major blockbuster books, further creeping into the publisher’s profitability. On the other side of the pricing debate is the booksellers themselves. America only has two major booksellers left: Barnes N Noble and Borders, and many of the smaller independent have started shutting down due to Amazon. If the digital revolution takes hold with book-buying customers at too low a price point, it could also mean the end for traditional printed books, as there won’t be any bookstores left o sell them. Borders has already closed the majority of their stores in the U.K. Some are advocating that the publishing world should step away from digital publishing and should discourage their customers from buying e-books by setting a high price for them. A similar idea has been put forth to save newspapers, which seems to be failing. Many, however, realize that trying to hold back the digital revolution simply won’t work. Anne Rice, one of the most popular paranormal and horror writers in the world, said, “The only thing I know is a mistake is people trying to hold back e-books or Kindle and trying to head off the revolution by building a dam. It’s not going to work.” Publishers, a notoriously conservative business as a whole, are going to have to find a way to start looking towards the future, if they want to make their products viable and profitable once more.